Scheduling a deposition can be a lot of work. You have to find out who the parties are, gather all of their contact information, prepare a deposition notice, not to mention call to arrange for a court reporter to attend. To provide convenience in the scheduling process, many court reporters now offer the ability to schedule depositions right from their websites. An online deposition scheduling form allows you to simply go to the court reporter’s website and put in the pertinent details. A message will be sent to the court reporting firm, who then sets up the deposition for you. Because you can schedule at any time of the day, any day of the week, this service can be extremely convenient and can save you time. To hire a court reporter for an upcoming deposition, it is best to be well prepared to answer questions on the online scheduling form. You will need some simple pieces of information about the deposition and the parties involved. If you gather these pieces of information before heading to the court reporting website, you will be able to easily and quickly schedule a deposition in minutes. If you are not the scheduling attorney, you will need to be prepared to give his or her name, name of the firm, address, best phone number, fax number and email address. Having this contact information is important in case the court reporting firm needs to reach the attorney in the event there is news or more information that needs to be shared. When scheduling the deposition, you will need to provide the name of the person being deposed. You should know the location that has been chosen, as well as date and time the deposition will begin. If you are in need of a conference room, many court reporting firms will have one available that you can reserve. You will likely be asked for the caption of the case. If you have a notice of deposition, you should send this in to the court reporting office. If you do not have a caption, then at least know the name of the parties involved and case number if possible. 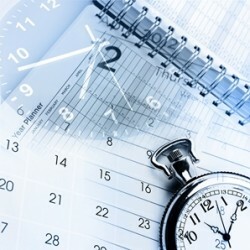 Many firms will ask you to provide an approximate time you think it will take for the deposition. This helps the court reporting firm to schedule the many other depositions it handles in a day. If your deposition is going to take all day, the court reporting firm will want to know that so they can be sure to send you a reporter who is available for the full day. If you have prepared a notice of deposition, much of the information above will be already included in the notice. Do provide the court reporting firm with the notice of deposition. If you do not have one prepared at the time of scheduling, be sure to send the notice as soon as you have one prepared. Online deposition scheduling can be a true time-saver, especially if you have all of the important details in front of you at the time you schedule. If you are interested in scheduling a deposition with Brown & Jones Reporting, you are welcome to use our own online deposition scheduling page here. After submitting your request, you will receive a confirmation email acknowledging your scheduling request. This entry was posted on Wednesday, August 7th, 2013 at 7:30 am	and is filed under All Posts, Court Reporting. You can follow any responses to this entry through the RSS 2.0 feed. You can skip to the end and leave a response. Pinging is currently not allowed.